Now approaching their 30th year of touring and recording since their initial 1983 release, Steve Smith and Vital Information has become a formidable jazz/fusion juggernaut whose longevity surpasses every major fusion group. Over the past 30 years some of the extraordinary musicians that have toured and recorded with Vital Information include Mike Stern, Dean Brown, Tim Landers, Dave Wilczewski, Kai Eckhardt, Larry Grenadier, Bill Evans, Jeff Andrews and Frank Gambale. The group’s founder and drummer, Steve Smith, has a history that stretches from Journey and Steps Ahead to The Buddy Rich Big Band, Ahmad Jamal, Zakir Hussain and Hiromi. It is no surprise that he won Modern Drummer Magazine’s #1 All Around Drummer award five years in a row and was voted one of the Top 25 Drummers of All Time in a recent Modern Drummer readers poll. 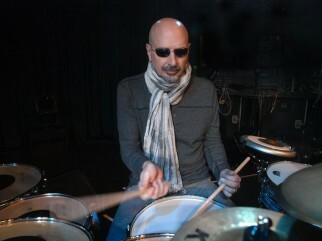 In 2002 Smith was voted into the Modern Drummer Hall of Fame. From 2008-2010 Drum! Magazine readers have voted Smith #1 Jazz Drummer. His educational Hudson Music DVDs Steve Smith – Drumset Technique/History of the U.S. Beat and Drum Legacy – Standing On The Shoulders Of Giants are best sellers in the music educational market. Smith is quick to point out that a key to the band’s remarkable versatility is its bassist. “Baron brought a real serious groove element to the band,” says Smith of his rhythm section partner since 1998. “He’s my favorite bass player to play with because he can play all styles and he always makes the music feel so good.” Browne has worked in the past with Gary Burton, Billy Cobham, Jean-Luc Ponty, Steps Ahead and Tom Jones. The distinctive multi-keyboardist Tom Coster, whose versatility ranges from Hammond B3 to accordion, was playing with Gabor Szabo and Rahsaan Roland Kirk before he came to prominence in Santana, a stay that lasted nine years. Coster composed or co-composed many of Santana’s most popular tunes including Europa, Dance Sister Dance and Carnaval. He has recorded many solo albums under his own name and has been a member of Vital Information since 1986. Vinny Valentino has been touring and recording with Vital Information since 2006 and is also a recording artist and educator. At age 16, influenced by the music of George Benson, Vinny began pursuing jazz as a career. He recalls, “The turning point for me was hearing George Benson in concert, it was an eye-opening experience.” Vinny and his mentor George have since developed a close friendship. George Benson refers to Vinny as a “young genius with brilliant tone and fresh ideas.” Vinny earned his Bachelor of Music in Jazz Studies at Howard University and has shared the stage or recording studio with such jazz greats as Gary Bartz, Randy Brecker, Bill Evans, John Pattitucci, Richard Bona, Bob Moses, George Benson, Steve Gadd, Dennis Chambers, and Jimmy McGriff.